Solo Acoustic Concert From Colin Meloy, Laura Veirs Colin Meloy, frontman for The Decemberists, and art-pop singer-songwriter Laura Veirs perform a night of solo, acoustic work, recorded live in concert. Both performances, from The Birchmere in Alexandria, Va., can be heard in their entirety online. Frontman for The Decemberists Colin Meloy and Seattle art-pop singer-songwriter Laura Veirs perform a night of solo, acoustic music, recorded live at The Birchmere in Alexandria, Va. Both performances originally webcast live on NPR.org Jan. 28 with All Songs Considered host Bob Boilen. Downloadable versions of both concerts will be available on Monday. Meloy is touring with just his guitar while the rest of The Decemberists take a break following the success of last year's break-out release Picaresque. A full, live performance featuring The Decemberists was featured on NPR Music's concert series in May. 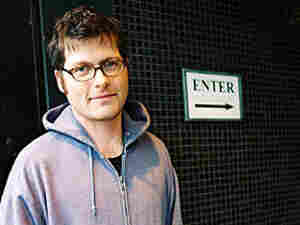 For his solo act, Meloy will perform works by The Decemberists as well as selections from his new EP, Colin Meloy Sings. The solo CD is only available at Meloy's live shows. Laura Veirs, a Seattle singer-songwriter, crafts inventive and artful pop songs with quirky rhythms and riffs. Her music is intimate and, at times, atmospheric with poetically puzzling narratives. Her most recent CD, Year of Meteors made some of last year's best-of lists. Veirs records and tours with her band, The Tortured Souls. But for Saturday's performance at The Birchmere she'll perform alone with acoustic guitar.